Movie scenes bring your presentations to life, but can leave yourself and your clients open to litigation if you are using them illegally. Now, Shift Happens has teamed up with the Motion Picture Licensing Corporation (MPLC) to offer you a special value on the Umbrella License. Speakers may legally use as many movie scenes as necessary in each presentation to enhance their message. Why Would I Choose to Purchase a License? Protect yourself and your client from copyright infringement and litigation. Movie scenes increase retention levels in presentations. Stand out from the crowd by offering your customers the added value of legal protection while also using great movie scenes. Inject humor into your presentation. Stress a point by adding the perfect movie scenes. Each presentation may utilize different scenes from different movies. Unleash your creativity without limitations. Why Do We Need a License? Pre-recorded motion pictures and other programs currently available in any legal audiovisual format, such as DVDs, or authorized delivery system (hereafter referred to as “Video”), are intended for personal, private, home use only. Viewings or exhibitions outside of the home, such as for a speech or presentation, require a license. This applies regardless of whether you show a two minute scene or the whole motion picture. Title 17 of the U.S. Copyright Act gives copyright owners control over the use of their works. Civil penalties for unauthorized exhibitions start at $750 for each inadvertent infringement and go as high as $150,000 for each egregious violation. Shift Happens has negotiated a special agreement with the MPLC to provide you with a discount on the Umbrella License. Over 250,000 locations in the U.S. and over 450,000 locations worldwide, from the smallest libraries to the largest multi-national corporations and federal government agencies, have the Umbrella License. To obtain a license, simply complete the form provided on this page and submit it. Upon receipt, a Certificate of License will be sent to your attention, and you can begin showing Videos from MPLC’s wide range of producers immediately! Q. We own the Video. Do we still need a license to view or show it in public? A. Yes. The location requires a license regardless of who owns the Video. While you may own the actual Video, you are only granted the right to view it in your home, not to perform it in public. Q. We are non-profit and do not charge admission. Do we still need a license? A. Yes. The U.S. Copyright Act applies equally to non-profit and for-profit organizations, regardless of whether an admission fee is charged. In fact, the Umbrella License does not cover showings where an admission fee is charged. Q. We are not open to the general public. Do we still need a license? A. Yes. Any location outside of the home is considered public for copyright purposes. Q. Is there a limitation on the number of scenes we can include in our presentation? A. No. You may show an unlimited number of scenes from over 25,000 available titles from any of our producers and studios. Q. We are only showing a one minute scene. Do we still need a license? A. Any portion of a Video needs to be licensed. I’d Like to be Legal – How Much? All licenses are valid for 1 year from the time of activation. This program and these rates are for public speaking professionals only. This rate is not for corporate presentations. Please click here to download the application and return it via U.S. Mail, fax or email. Your license will not be finalized until you are contacted by the MPLC. Please fill out the form and indicate you are a referral from Shift Happens!® MPLC will contact you for the next step of the licensing process. 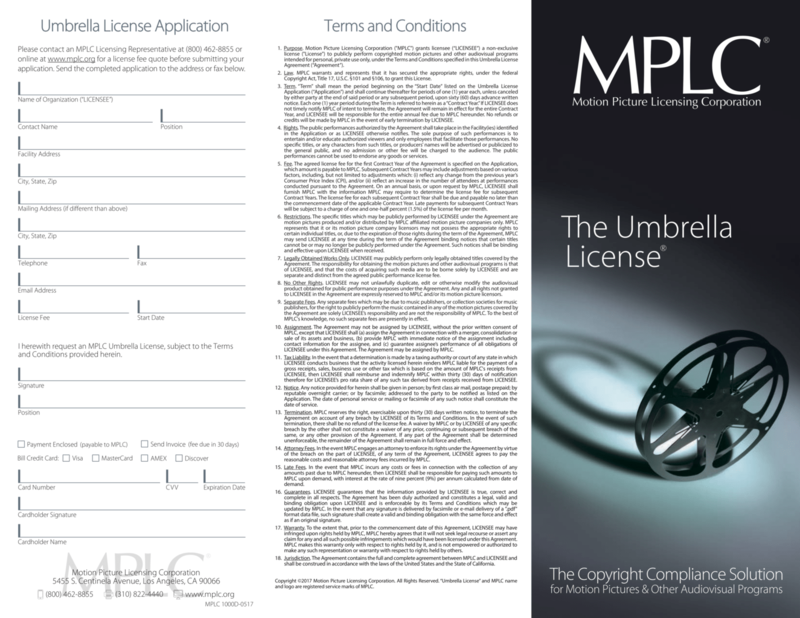 “Umbrella License” and the MPLC name and logo are registered service marks of the MPLC.